Maira Kalman did a whimsical and moving essay on the inauguration, on-line on the Times site. I too think that is a Very Good Question. If one of the general principles of our country is the separation of church and state, why then is religion so much a part of of the inauguration of the president of the "state"? There was an invocation and a benediction, with a bible in between for an oath that ended with "so help me god". No "so help me god". Please tell me why our politicians feel the need to add "so help me god" and "god bless America" at every turn? Why do they swear on a bible? I always say that I'm going to use a dictionary when I get sworn in. 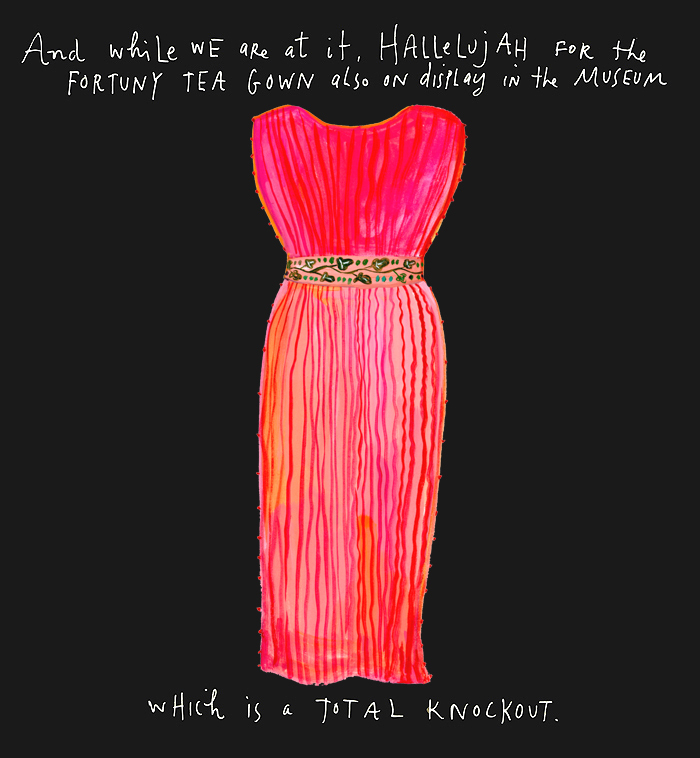 Another panel in Kalman's essay is a drawing of a red Fortuny dress. When I win the lottery, I want one. I've wanted one ever since the first time I ever saw one, a long long time ago. Sigh. Something about the pleats makes the dresses flattering no matter what the body shape. The colors are always fabulous. The simple little details. Sigh. I could wear it to my inaugural ball. Same reason they added "under God" to the Pledge. No one quite gets that separation thing...sigh. My husband is from the States and I think, was shocked, when he moved up here and saw the immersion of church and state that resides in the US. Up here there is a tenuous seperation but from here, on the outside, there doesn't seem to be an ounce of seperation down there. Curious thing. Why bother claiming seperation, I've always wondered. Or why not do something about it. And I know the answer. There would be a huge negative reaction to seperation from very vocal Christians, you know, the ones with lots of money and clout. I want a Fortuny gown, too. I agree. Very Good Question. One thing I did like about Obama's speech was that he actually included "nonbelievers" when talked about religious diversity. I dug that. When I was a senior in high school—in Utah, mind you—I was part of an ACLU lawsuit to stop prayer at high school graduations. So you know I agree with you. That's funny - I always said that when I was sworn in, it would be on the constitution, because that document has more meaning to me and (in my opinion) is more appropriate for the job at hand. Ok gals. Get out your Constitution. The "Establishment Clause" of our Constitution states that "Congress shall make no law respecting an establishment of religion". The meaning of that phrase meant that unlike specific colonies at the time, and unlike England, there would not be the establishment of a state religion. It also means that no religion shall take precedence over another. It does not mean that everything must be purely secular. In fact, there is mention of G-d in many aspects of our government and I believe (but can't remember which one--I think Jefferson) one of the framers of our Constitution famously said that democracy can not work without belief in G-d or a higher being. In any case, the current divisions over what has become the "separation of Church and State" are more a function of the Supreme Court rulings after WW II. G-d is on our money, in our oaths and chaplains have always presided in Congress etc. There are many ways religion is involved. The key is that it not be one over another. Many thanks to needle, above. Also, when I went to Washington in 1976 at 14 I saw an exhibit with Fortuny gowns rolled up into balls in a basket, and a lovely gown on a mannequin. The exhibit said Fortuny's process died with him, but the website says it is still alive and kicking. Strange that both Washington neurons would be fired by one post. I get confused sometimes, isn't it that there is no guarantee of separation of church and state, but rather a protection from a state mandated or state sponsored religion? Good question. It makes all my history major training ick in and want tio go research the evolution of "sepatation of Church and State" (although it seems Needle did a good job starting us in the right direction). On the other hand, I do agree with you - I wish there was more separation. I am Jewish and always wondered what they would do swearing in a Jewish president? We Aussies find the American 'outthereness' of religion rather baffling. Religion is a fairly private thing here. Amen, sister! And, though I love the dress, I'd never be able to pull it off so you can have it. You're welcome! You should so find a way to get that dress. I think using the Bible for the inauguration is something that is steeped in tradition. I personally think it would be a little sad if they changed that after all this time. My personal pet peeve is hearing politicians end their speeches with "And God Bless America". They say it in such a demanding tone that I want to ask them why America should be blessed and not the other countries and people on the planet. When you win the lottery...can I borrow your dress? something I myself wonder constantly. but apparently I'm crazy because I suspect more than one of the founding "fathers" were atheists. Yes. These dresses look like they feel as good to wear as they look. I want one too. Thanks for this. I just found your blog via the Cat Cora conversation (I write about cats and dogs, it's a long story)...but I am a Maira Kalman and separation of church and state freak...so: kismet.